Oh, baseball. It’s finally time for baseball. And boy do I need it. After several dense and exhausting posts, (including one that detailed how death once visited St. Louis), it’s time to lighten things up. And what better time to do it than right now, because baseball is finally here again. I’ve taken a swing at St. Louis baseball previously in Distilled History, and my fun search for where baseball has been played in this town remains one of my most popular posts. I’m still catching hell (often) for not being a Cardinal fan, but I hope my appreciation for the history of the game in St. Louis allows me a brief reprieve. That’s unlikely, but as I mentally prepare for a certain down year in the Bronx, I decided to take a longer look at one particular St. Louisan who had a major impact on the history of my favorite game. That’s right. As baseball fans, we should all take a moment and thank Chris Von der Ahe for beer. Well, maybe not beer in general, but certainly how it relates to the game of baseball. It sounds crazy now, but before Chris Von der Ahe stuck his bulbous nose into professional baseball back in the 1870’s, taking in a professional baseball game while sipping a cold beer was no easy feat. In fact, it was completely forbidden. My interest in Von der Ahe was kindled by a recent book suggestion. The Summer of Beer and Whiskey by Edward Achorn details the story of a riveting pennant race the St. Louis Browns participated in during the summer of 1883. It’s a wonderful story of 19th century baseball, and Chris Von der Ahe is Achorn’s central figure in it. Von der Ahe’s larger-than-life personality pours off Achorn’s pages. He was bombastic, egotistical, and undeniably controversial. He drank often, he was a blatant philanderer, and he craved constant adulation from everyone around him. He was an incessant self-promoter, often telling stories of his rise to the top as cigar smoke wafted from beneath his walrus mustache. He was “portly”, he wore bowler hats, and he radiated confidence in heavily starched shirts. His German accent was so thick that utterances of “Paseball” and “Vas it a good game?” led some to amusement and others to underestimate his shrewd intelligence. During his time in baseball, his drive to earn a profit drove every decision he made. When he achieved it, he’d proudly walk down Grand Avenue behind a wheelbarrow filled with cash. When he didn’t, he’d start meddling in a game that he didn’t fully understand. His actions, fines, and demands often left his managers and players completely exasperated. He was “Der Boss President”, and he made sure everyone knew it. Christian Frederick Wilhelm Von der Ahe was born in Prussia on October 2, 1848. Many note his birth year as 1851, but as Achorn points out, it’s likely Von der Ahe changed the date intentionally in order to avoid military service in Germany. Freed from army life, Von der Ahe left his native country and emigrated to America in 1867. In 1870, just three years later, he’s running his own grocery store on the western edge of St. Louis. In the same year, he marries Emma Hoffman and the couple give birth to a son. His early days in St. Louis aren’t remarkable compared to the thousands of Germans who poured into Missouri in the mid-19th century. Von der Ahe was a businessman, and his decision to add a saloon to the back of his grocery store made sense. 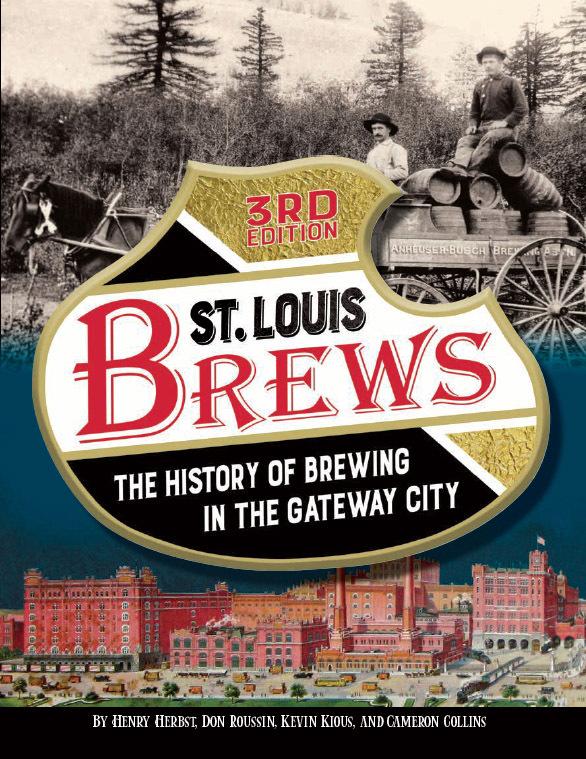 The beer industry was thriving in St. Louis in the 1870’s, and the opportunities to make money selling it were substantial. In 1874, Chris Von der Ahe stumbled upon one of them. That’s the year Von der Ahe moved his grocery and saloon to the northwest corner of Grand and St. Louis avenues. He likely didn’t realize his good fortune at first, but the new grocery stood just a block away from the Grand Avenue Grounds. That ballpark would soon become home to the first professional baseball club in St. Louis, the St. Louis Brown Stockings. In his book Chris Von der Ahe and the St. Louis Browns, author J. Thomas Hetrick tells the story behind Von der Ahe’s epiphany. On a warm summer day, Von der Ahe asked one of his bartenders, Ned Cuthbert, why the saloon frequently emptied for a just a few hours on certain days. Cuthbert, a ball player himself (and a future manager the St. Louis Browns), told him that’s when his customers walked down the street to see a ballgame. Suddenly, Chris Von der Ahe became very interested in baseball. Baseball in the 1870’s was a much different game than we know today. The sport had taken the country by storm in the years since the Civil War, but the game was still in its infancy. Players didn’t wear gloves, a coin flip determined who batted first, and foul balls caught on a bounce were considered outs. Sitting in the grandstands next to a woman was almost unheard of, and in an era when the Prohibition movement was gaining momentum, holding a mug of beer in your hand was nearing the same fate. In fact, baseball’s early years were so riddled with gambling, game fixing, and unruly behavior by players that many simply gave up on it. The first iteration of the St. Louis Brown Stockings, which folded in 1877 after a game fixing scandal, met the same fate as many 19th century ball clubs. Enter a man named William Hulbert. In 1876, as owner of the National League’s Chicago White Stockings (now known as the Cubs), Hulbert became a major force in restoring baseball to its proper place in American sport. His decisive efforts in opposing all forms of gambling, improving player behavior (on and off the field), and restoring integrity to the game are undeniably commendable. But many at the time believed he took matters too far. He set ticket prices at National League games at fifty cents, a price that assured only the wealthy and people of means would be in attendance. If a common laborer or lowly immigrant happened to get a ticket, the National League’s ban on Sunday baseball eliminated the only day of leisure available to a class of people required to work six days a week. Finally, every National League ballpark was strictly forbidden to sell alcohol to spectators in any form. To a German immigrant in St. Louis that had just started becoming interested (and investing) in baseball, such regulations were ludicrous. Chris Von der Ahe insisted that in cities with large German populations (such as St. Louis and Cincinnati), making the game accessible to immigrants and the lower classes was essential to making baseball profitable. Von der Ahe wasn’t alone in his opinion. The Cincinnati Red Stockings, baseball’s first professional team since its inception in 1869, was expelled from the National League in 1880 as a result of the team’s refusal to adhere to Hulbert’s strict regulations. With the folding of the Brown Stockings and Cincinnati out of the National League, two major western cities found themselves without a professional club. But in 1880, Chris Von der Ahe was persuaded by Ned Cuthbert and a man named Alfred Spink (the future founder of the Sporting News), to invest in a new professional baseball team in St. Louis. Seeing the game as a perfect way to sell barrels of beer to packed grandstands, Von der Ahe dumped his entire life savings into the venture. Along with obtaining the lease to the Grand Avenue Grounds (soon to be renamed as “Sportsman’s Park”) and upgrading the facility to hold over 10,000 thirsty cranks (the 1870’s term for “fans”), professional baseball was finally back in St. Louis. After a year of playing a schedule filled with semi-pro opponents, Chris Von der Ahe and representatives from five other cities met in Cincinnati in late 1881. When the meeting adjourned, a new professional league named the American Association had been formed, with plans to begin play in 1882. To lure cranks to their new league, American Association owners took direct aim at William Hulbert’s restrictive National League rules. At the insistence of the Von der Ahe and the Cincinnati Red Stockings, the sale of alcohol at games was allowed and even encouraged. Games could be scheduled on Sunday without fear of retribution. And most importantly, all six teams agreed to a ticket price of just twenty-five cents, making the game accessible to a class of people who had been previously priced out of baseball. On May 2, 1882, the season opened as Chris Von der Ahe’s St. Louis Brown Stockings faced the Louisville Eclipse at Sportsman’s Park. That game, which the Brown Stockings won 9-7, is considered the first one ever played in the rich history of the St. Louis Cardinal franchise. In the first several years of play, the American Association thrived. Crowds packed into grandstands as National League owners fretted about how to counter the “Beer and Whiskey Circuit”, a moniker the American Association owners didn’t mind in the least. Despite mediocre production from the Browns in the first few years of play, attendance at Sportsman’s Park soared. Von der Ahe capitalized on the support by lining grandstand aisles with vendors holding trays of beer and shots of whiskey. Marching bands entertained customers before and after games as Von der Ahe lured many of them back to his saloon for another drink. He even turned distant right field into an open beer garden, in which balls remained in play if they happened to be hit that far. Then the Browns began to win. Led by player/manager Charles Comiskey (and aided by piles of money Von der Ahe threw at the best players available), the Browns won four consecutive American Association pennants from 1885-1888. At the conclusion of the 1886 season, the Browns topped the National League champion Chicago White Stockings in an early version of the World Series. It must have been a fine day for Chris Von der Ahe to defeat the team of his old rival Hulbert (who had died in 1882) and own the best baseball team in the world. However, success would not last for Chris Von der Ahe. Despite repeated success on the diamond, his ego and pursuit of financial gain became a hindrance. He repeatedly fined players for poor play, barked orders at them from his personal box, and openly questioned managerial decisions. He once fined third baseman Arlie Latham for “singing and otherwise acting up” during a game. In another notable incident, his team openly rebelled after Von der Ahe chastised player in front of spectators. The team refused to get on the train after the game, and when they did play again, they started losing suspiciously. In 1885, he suddenly sold away five of his best players, infuriating his manager and opening himself up to severe criticism from the press. In time, the Sporting News would begin referring to him as “Chris Von der Ha Ha!”. Further salary dumps in 1877 fueled speculation that Von der Ahe planned to move the team to New York, a city with limitless baseball and beer profits that everyone knew he craved. His controversies weren’t limited to baseball.In 1895, Von der Ahe marched across Grand Avenue and attacked an African-American man he was certain had robbed his saloon. After landing several blows, he pulled out a pistol and fired it at the man’s feet. His unabashed womanizing led him to divorce (twice), notably from his first wife Emma who even smashed a bottle over the head of one of his lovers that had the nerve to appear at Sportsman’s Park. His only son Edward helped prove the infidelity in his mother’s attempt to sue Von der Ahe for divorce. When the trial ended, he severed ties from his father for good. But in the end, it was debt that took down Chris Von der Ahe. The more he meddled in the game, the more he alienated players, fellow league owners, and fans. Ticket sales plummeted, debt mounted, and the St. Louis Browns became the worst team in baseball in the 1890’s. After baseball minds got together and agreed to merge St. Louis and three other clubs into the National League, Von der Ahe’s players suddenly found themselves without a contractual obligation the Browns. The best of them jumped at the opportunity to sign with other clubs. After a litany of lawsuits and legal wranglings that peppered the decade, the end finally came in 1898. Failing to pay a settlement from a lawsuit brought against him in Pittsburgh, Von der Ahe was grabbed, thrown in a truck, and taken by force to Pennsylvania. Eventually freed after being jailed and put on trial, the incident was a massive source of embarrassment for the proud German. In the wake of it, with outlets such as the Sporting News calling for his immediate dismissal from the game, National League brass finally took action. In 1899, Chris Von der Ahe was forced from ownership of the St. Louis Browns and the team was sold at auction. In the years after his life in baseball, Chris Von der Ahe slowly faded into obscurity. Once a national name, he returned to the life of a simple saloon owner in St. Louis. But for a brief moment in 1907, Chris Von der Ahe was again able to bask in the glow of overwhelming adulation. At a dinner held to honor the history of the Browns at the Southern Hotel in downtown St. Louis, Von der Ahe stood before thunderous applause. For an evening, people forgot about the controversial Chris Von der Ahe and recognized him for all he had done for St. Louis baseball. For a fleeting moment, Chris Von der Ahe was “Der Boss President” again. It’s important to note that when the St. Louis Browns became members of the National League in 1892, no stipulation was put in place requiring the St. Louis club to cease scheduling games on Sunday or to stop selling beer to its fans. It took several years, but as Edward Achorn details in the epilogue of his wonderful book, other National League teams eventually chose to shed the silly restrictions as well. Today, millions of baseball fans go to Sunday ball games and order large, expensive beers without giving it a second thought. It’s likely that would have become possible without Chris Von der Ahe’s meddling, but he was still the first to make it his issue. And for that, we should all raise a glass to the man. For my own personal toast, I’m in somewhat of a bind because I can’t drink a beer at the ball game. The St. Louis Cardinals are opening the season in Chicago and my favorite team plays 1,000 miles away. But I do love listening to baseball on the radio. Instead of packing into a crowded sports bar, I’m going to take the opportunity to enjoy St. Louis before the summer humidity gets here. While I listen to the Yanks play the Blue Jays on the porch of my little house in south city, I’ll throw down a few cold beers. Baseball is here again, and I’m a happy man. Note: Like Von der Ahe’s personality, the full story of our “Boss President” is far too big to fit into a single post. I’m already thinking the story of his demise is one that I may need to detail further in this blog at some point in the future. In the meantime, the following sources can provide a detailed (and fascinating) look at the full story behind of Chris Von der Ahe. I vote for bringing back the men walking around at the game with trays of whiskey shots! Of course I love this post. In Bellefontaine you can also see the Spink family tomb and sadly the unmarked grave of Ned Cuthbert. So glad you liked it! And if you recall, it was you that recommended The Summer of Beer and Whiskey on the fantastic tour you gave me. Thanks again!